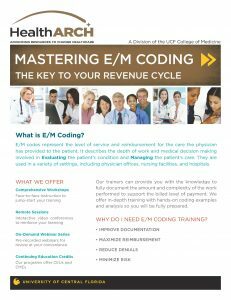 HealthARCH provides a variety of Evaluation and Management (E/M) Coding training options including consulting, workshops and webinars for coders/billers, practice managers and physicians/clinicians. Our certified trainers can prepare you and your practice to properly assess documentation according to national guidelines, understand how to apply the rules, and ensure appropriate E/M category and level assignment. Evaluation and Management (E/M) Coding is a system for medical billing that medical providers are required to use for reimbursement from Medicare/Medicaid and private insurers. E/M services describe the time and work involved when a provider of service is evaluating a patient’s condition(s) and determining the management of the care required to treat the patient. E/M is not specific to one medical specialty, nor is it specific to one body system or an anatomical area. Our AHIMA-Approved trainers can provide you with the curriculum and knowledge your practice needs to be fully compliant and help increase your revenue. WHY DO I NEED E/M CODING TRAINING? The introduction of electronic health records (EHRs) has introduced significant challenges to maintain E/M documentation and coding compliance. These coding discrepancies; templates, Cloning and “Copy and Paste” usage, have increased “over-billing.” The purpose of the CMS RAC audits is to identify non-compliant practices and facilities. Our trainers can provide you with the knowledge to fully document the amount and complexity of the work performed to support the billed level of payment. We offer in-depth training with hands-on coding examples and analysis so you will be fully prepared. This workshop provides a step-by-step process for understanding the required documentation needed for selecting the appropriate E/M code. We will discuss the elements of documenting a patient history, recording the exam, and determining the level of medical decision making. Participants will have the opportunity to practice with real world scenarios. Attendees are eligible for 8 hours of CEU credits. This program meets AAPC guidelines for 8.0 CEUs each. Can be used for Core A and CEMC for continuing education units. Click here for current training dates.